Dan, Wiebke, Mindy and I traveled to Southern Utah to spend the weekend exploring Zion National Park. Zion had been the park that I had actually visited the least during my time in Utah, so this trip was a long time coming. 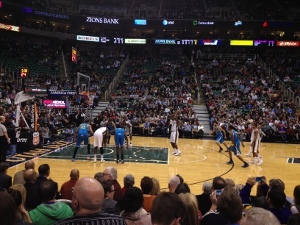 Tonight, I decided to take advantage of the poor weather and the poor opponent to get a good value on some great seats to a Utah Jazz game. 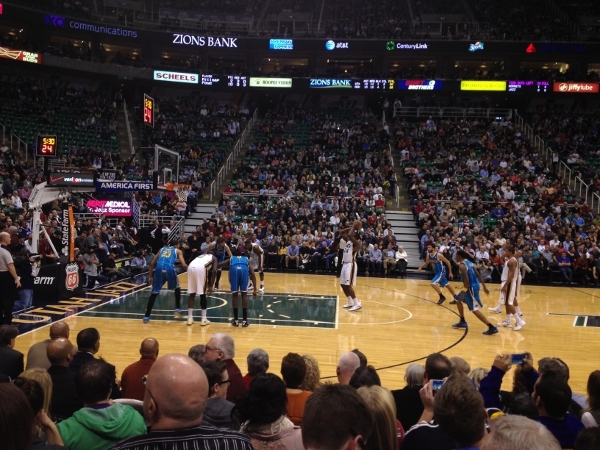 So, for about 50% off the face value of the tickets, I was able to cross "great seats to an NBA game" off my bucket list. We sat in row "4", right behind the New Orleans Hornets' bench. (Row "4" is actually seven rows from the floor.) It was simply awesome to watch an NBA game from that close. A huge winter storm hit the Wasatch Mountains starting on Friday. It snowed for more than two days straight. Parts of the valley received over a foot of snow. The Cottonwood Canyons ski resorts received over 40-inches of snow. This evening, I ventured outside to capture some photos of the mountains covered in a fresh blanket of snow. We took a last-minute/last-chance trip to the Tetons for the weekend. We had planned to make a trip to the Tetons at some point during the summer, but it just never happened. On a trip back to New York for my sister's wedding, we took some time to see a couple ballgames. On an extended layover in New York City, we watched the Orioles play the Yankees at new Yankee Stadium. Later in the trip, we took a day-trip to Niagara Falls and Toronto to watch the Blue Jays take on those same Orioles at Rogers Centre (formerly SkyDome). 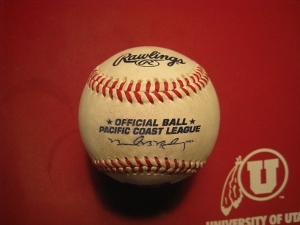 I got a couple fingers on this hard line drive foul ball down the right field line at tonight's Salt Lake Bees game, but I couldn't quite reach it. Luckily, though, the ball bounced back towards me and I was able to grab it before it rolled away. I've spent the past week in Chicago attending the QRM Conference. (QRM makes financial risk management software that I use at my job.) The conference was very good. I liked having the opportunity to learn more about that software. I also enjoyed all the activities QRM planned for us attendees. Who's that handsome guy wearing a Blue Jays hat sitting on the aisle at the Blue Jays vs. White Sox game on June 6, 2012? It's me! 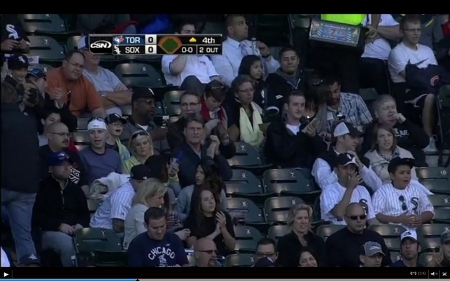 I was watching some highlights of the game on MLB.com when I noticed myself on the White Sox broadcast of the game while they panned over the crowd after a great play by Orlando Hudson of the Sox. Cool! I had the fortune of attending 311's biennial concert/convention. This year, they decided to hold two concerts instead of just one. I applauded that move, since the ridiculously long show in 2010 had too many intermissions and you could tell the band (and much of the crowd) were absolutely dead tired by the end of the performance. I took another last-minute, short trip to California to visit my sister and my parents, who were in town visiting my sister. © 1999–2019 Mike Sandy. All rights reserved.